Our range of products include hose clips. We provide the Hose Clips to the clients. 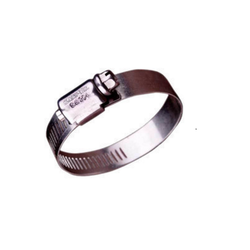 Stainless steel clamps provide high quality, corrosion resistance, high reliability and long life. Vibration proof quality by worm drive principle ensures retention of the pressure on the hose and so leakages of costly/dangerous fluids are avoided. The smooth bottom surface does not wear the hose at the same time perforations on the band keeps the clamp intact at high pressures also. The wide range of clamps for full satisfaction of customers needs as per their requirements.